Three US aircraft carrier strike groups will hold joint drills in the Western Pacific, the Pentagon has confirmed. It comes as the US President continues his Asia tour, reiterating Washington’s willingness to use military force against Pyongyang if necessary. 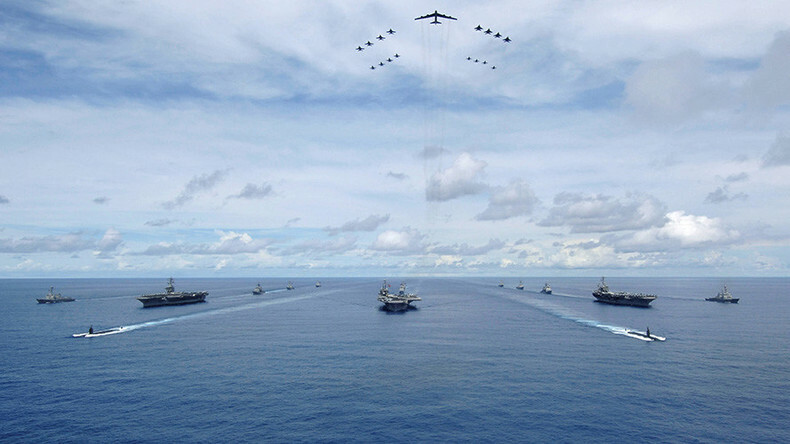 In the largest naval exercise in a decade, the USS Nimitz, USS Ronald Reagan and USS Theodore Roosevelt strike groups will soon join forces in the Pacific, Reuters first reported Monday. The report added that a Japanese destroyer, the Inazuma, will join the US maneuvers. In 2007, the USS Nimitz, USS John C. Stennis and USS Kitty Hawk carrier strike groups joined forces in combined drills near Guam. 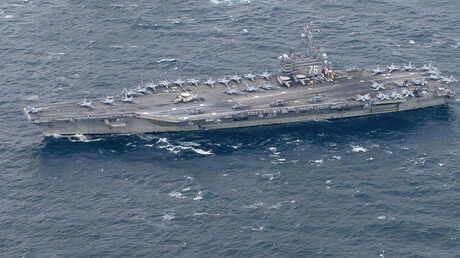 On Wednesday, the Pentagon officially announced that the three strike carrier groups will jointly conduct drills forces from Saturday to Tuesday. The four-day exercises will focus on carrying out air defense drills, sea surveillance, and replenishments at sea. The drills will also include rehearsing defensive air combat training and close-in coordinated maneuvers. “Units assigned to the strike force will conduct coordinated operations in international waters in order to demonstrate the US Navy’s unique capability to operate multiple carrier strike groups as a coordinated strike force effort,” the 7th Fleet command said in a statement. News of the upcoming maneuvers emerged as President Donald Trump continues his 11-day Asia tour. The trip is aimed at pushing the international community to apply maximum pressure on Pyongyang over its nuclear and ballistic programs. Trump kicked off his trip by visiting Japan and South Korea. The US president is currently in China where he is keeping the focus on North Korea and trade imbalances. Trump will stop in Vietnam Friday, before flying to the Philippines Sunday. North Korea views any naval drills in the vicinity of its borders as a direct threat to its national security.Pyongyang has repeatedly warned that it would use its nuclear arsenal if provoked by US and its allies. Fears of an all-out war between the US and N. Korea is further amplified by constant exchanges of threats between Trump and Kim Jong-un. Amid the ongoing tensions, China and Russia have been calling on both countries to show restraint. “Currently, the situation on the Korean Peninsula is highly complex and grave. All relevant parties should exercise restraint, avoid provoking each other, jointly stay committed to easing the tensions on the Peninsula and meanwhile make positive efforts to pull the Korean Peninsula nuclear issue back to the track of seeking settlement through negotiation at an early date,” Chinese Foreign Ministry spokeswoman Hua Chunying said Tuesday, responding to the planned US naval drills.